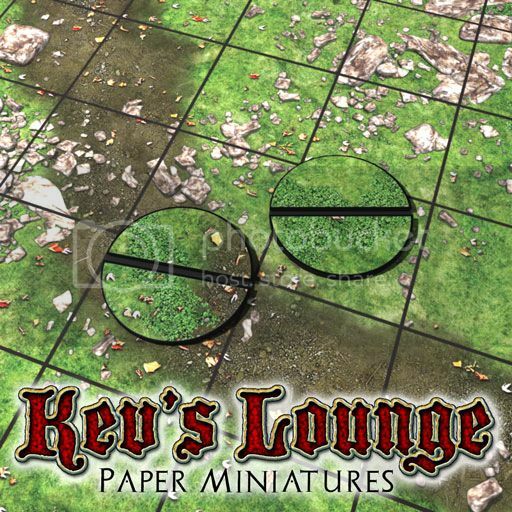 Added some new base options to the growing collection of Kev's Lounge Paper Miniature Bases. 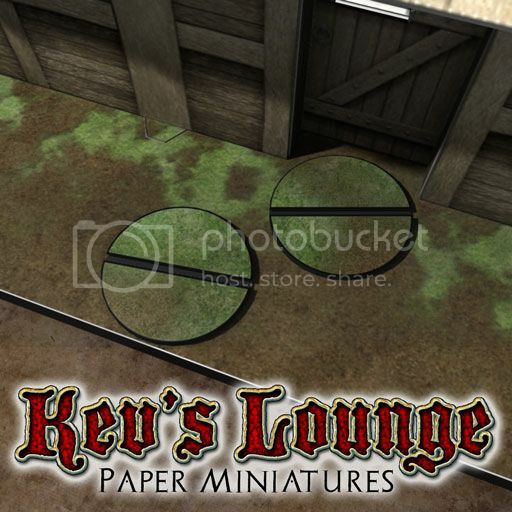 Kev's Lounge Paper Mini Bases are free and easy to build! They're designed to slide off, allowing you to store your paper minis flat and to allow you to swap bases on the fly. Though designed specifically to work with Kev's Lounge Paper Miniatures, any paper miniature by any of the many talented designers on this board can easily be modified to work with them. I like the idea of bases blending in but often figs are moving from terrain to terrain and nobody likes switching bases in the middle of their turn. In theatre, when we need a neutral stage, designers often use a grey floor spattered with shades of grey, brown, black and white. I couldn't get it to work for me, but I'm strictly amateur. Another idea I discussed with Kane on these boards years ago was to have a base that suggested the shadow of the figure. Maybe just darker in the middle and fading towards the edge. Since you are in base mode, maybe you would like to give it a try. Or not, your call. Hi there! Thanks very much for your feedback! The idea is not so much about making the bases hot-swappable, as it is about making them removable so that the miniatures and the bases can be stored flat between games... it just so happens that one of the benefits of this is that the base texture can be swapped to match whichever terrain you're using that games session. That feature comes in handy when one is doing photoshoots and you'll see my bases show up pretty often, particularly in OldSchoolDM's pics, just because they're useful that way. As to your suggestion, I entirely agree. Most of my bases are decidedly neutral, but it sounds like the base with Dave Graffam's Mud texture might be perfect for the "neutral stage" suggestion as it stands. Cutting out circles isn't particularly difficult with a sharp pair of scissors, which is why I put a bit of white space between the bases. It makes it a little easier to get a nice clean edge while trimming around it. Even if you don't manage a perfectly smooth cut, it'll look perfectly neat once you've edged it with a marker. I'm going to add some square bases in all the current flavours after I release the Skeleton Skirmishers so that people can rank them up easily. I may add some hex and octagonal bases too, because some people favour those. Cutting out circles isn't particularly difficult with a sharp pair of scissors ... I may add some hex and octagonal bases too, because some people favour those. I've come to prefer octagonal as a better compromise between hex and circular for paper bases in recent times, as also something easier to cut using a straightedge. Hex can look a bit too "boardgame" if you're not using that sort of movement grid to me, though really it works just as well! I've added some 50mm round bases to go with the Terrors of the Rocklands set. Only 3 textures for now, but I'll be adding more as I go. I've just added some new free paper mini bases! The 50mm bases give some interesting outdoor alternatives for the Terrors of the Rocklands paper minis set I released a couple months ago. I apologize for the forum necromancy here, but are these bases still available anywhere? Unfortunately, the Papercraft Dungeon is down for revamping, and that killed all the links. I sent an email through the website, but got no response. We needed to upgrade because Paypal changed their policies and the software we were using was no longer compliant. Unfortunately, we had a long series of misadventures while doing the upgrade, including the fact that the hosting services we were using at the time was not interested in hosting e-commerce anymore because of the requirements of the current generation of software and so we were forced to change hosts... We've now got a site up there, but we haven't moved any of the data across yet as we've been busy converting it over. Been a slow process because there are some minor incompatibilities between the old software and the new that caused some major bugs. As I'm typing this, we've basically completed the migration of the data to our test server and have resolved pretty much every bug that we could find so far, and so we're actually getting ready to move it all over to the main server so we can take the site live again. That should happen within the next 24 hours, if all goes smoothly with the data transfer. ...are these bases still available anywhere? Unfortunately, the Papercraft Dungeon is down for revamping, and that killed all the links. I sent an email through the website, but got no response. I don't think they are, unfortunately. 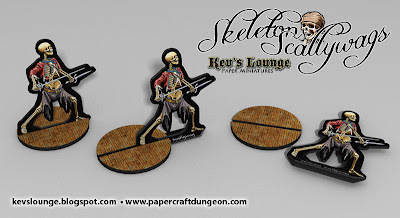 If you're desperate for some, there are some of the same style of bases available in the Kev's Lounge/Papercraft Dungeon mini sets on the OneBookShelf sites (DriveThru RPG, etc. ), some of which sets are Pay What You Want, so technically free, unless you wish to pay something for them. The bases in those tend to be a selection appropriate to the individual mini set, however (though this does include some textures you won't find in any other of the current Papercraft Dungeon base sets). Hopefully the new Papercraft Dungeon site will be up and running shortly, but if not, I'm sure there are a few folks around here who could let you have a set of whatever texture and size of these bases you may need more immediately. If there are any bases that you're specifically looking for and can't wait for the store to come back up, please let me know and I'll put them in a dropbox folder for you. Thanks for the quick responses. I am currently kicking around an idea for a 5E campaign that will have both indoor and outdoor encounters, and having swappable bases between encounters would be nice, especially if they match the terrain. I would like the meadow 25mm and 50mm bases for the outdoors stuff. Going through the base packs from the minis I bought so far and what I did download from your website a couple months ago, I have a 25mm damaged flagstone, and a 50mm non damaged flagstone file. Is there a 25mm non damaged flagstone or 50mm damaged flagstone options? Thank you so much! I've got a lot of mini and base cutting to do in the future!